The Kansas bench celebrates during a game this season. The Jayhawks are currently 10th in the NET rankings. Photo by Denny Ledley/USA Today. As of Dec. 1, the Kansas Jayhawks had two wins against AP top 10 teams: Michigan State and Tennessee. They’ve also beaten Marquette, who was picked to finish second in the Big East this season. Meanwhile, the Belmont Bruins were 6-0 with their best win coming against Lipscomb. 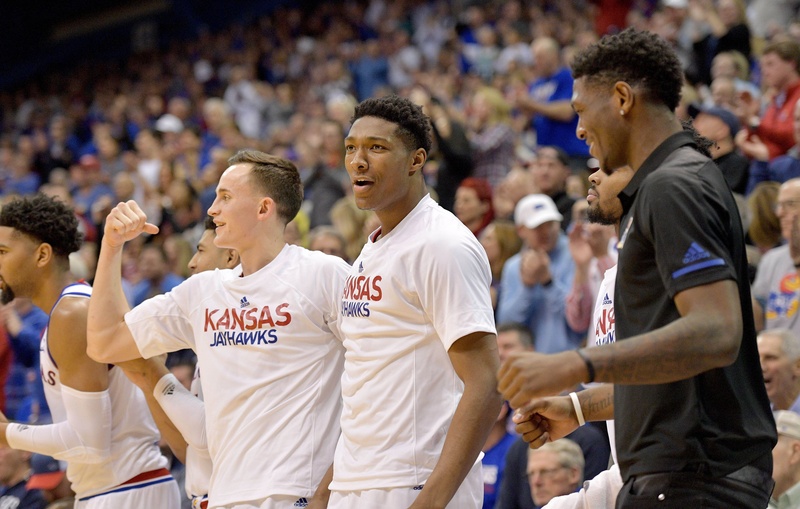 As a result, the Jayhawks were ranked No. 2 in the AP top 25 while the Bruins are unranked. Seems logical. But there is a ranking system that ranked the Bruins ahead of Kansas. I know what you’re thinking. It’s probably one of those rankings on an obscure site created by someone who doesn’t know what they’re talking about. Nope. It’s the NCAA Evaluation Tool, or NET rankings, that had the Bruins ranked ninth and the Jayhawks 14th. I have nothing against Belmont. They are clearly the best team in the Ohio Valley Conference and have maybe the best player in the league in Dylan Windler. If you asked me to decide whether or not they’d be in the NCAA Tournament come March, I’d probably say yes. But they shouldn’t be ninth in any national ranking. The NET rankings are college basketball’s newest ranking system and are going to replace RPI. The RPI, or rating percentage index, is used to rank teams based on the quality of wins and losses and strength of schedule. Moving forward the NET will be the main measuring stick in deciding which teams will make up the tournament field come March, hence the name, “NCAA Evaluation Tool”. According to the NCAA, the rankings rely on game results, strength of schedule, game location, scoring margin, net offensive and defensive efficiency, and the quality of wins and losses. I have a fundamental problem with this. It’s not logical to have a ranking system that produces these results, especially when these rankings are used to determine NCAA tournament fields. Even as the rankings continue to collect more data and the system begins to work itself out. Through games on Dec. 3, Utah State is ranked 18th on this list, Radford is 29th and San Francisco is ahead of them at 26th. Where this really becomes a problem is in the NCAA’s quadrant system. The quadrant system was implemented last season to group teams into categories to determine quality of wins. It’s considered a good addition. But now quadrants are based on the NET rankings. A quadrant one win, the best kind of win you can get, is defined as a home win against a team ranked between 1-30 on the NET rankings, a neutral court win against a team ranked 1-50 and a road win against a team within 1-75. This is essentially how the NCAA selection committee determines how good your wins are. It worked fairly well last year. But as of Dec. 3, beating the aforementioned Utah State and Radford on your home court counts as a quadrant one win. But if I were to beat Villanova, Marquette, or Florida State on my home floor tonight, it would count as a quadrant two win. In no universe should I get more props for beating Radford on my home floor than beating Jay Wright’s Villanova. But according to the NET Rankings, that’s the case right now. Hopefully everything will work itself out as the season progresses. And I understand these rankings will more than likely look the way they are supposed to by the time it matters. I’m just not sure how these rankings could ever produce these results. I can’t comprehend why we need another ranking system. It is not that hard to pick 68 of the best resumes at the end of a college basketball season. What are we trying to achieve? What was missing in the way the tournament field was selected every season? Between top 25 teams and the fact that 32 teams get an automatic bid, I could easily give you 50 teams that should make the Big Dance. In other words, no team that has a real shot to win a national championship is being left out. If nothing else, the NCAA should have waited until the rankings made sense to avoid the backlash they have gotten from coaches and the media. We just don’t need these rankings yet. They aren’t publicly advertised anywhere like the AP poll is, so why is the NCAA in such a rush to publish them? All the NET rankings do is invite unnecessary criticism. Putting it out now does nothing but expose its early-season inaccuracies, just like any other poll driven by data. When it does work itself out, chances are it won’t look all that different from the RPI anyway. Change for change’s sake, which is all the NET rankings are, doesn’t achieve anything.